Top Senate Democrats say they are closer to signing Republican-backed bill that would slash aid to the PA unless it stops paying terrorists. Top Senate Democrats say they are closer to signing on to a Republican-backed bill that would slash aid to the Palestinian Authority (PA) if it did not stop subsidizing jailed terrorists, JTA reported Friday. 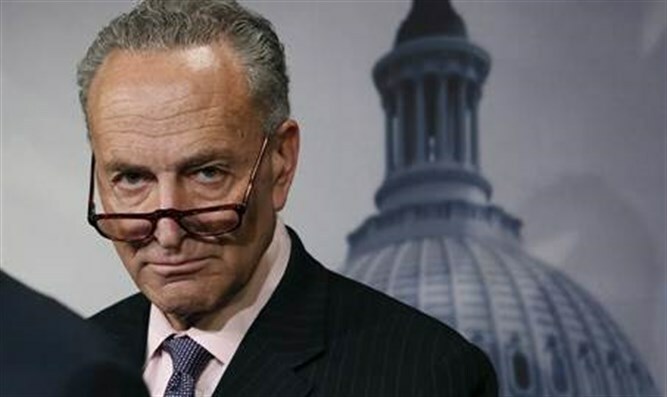 Sen. Charles Schumer (D-NY), the minority leader in the Senate, told attendants at the Orthodox Union’s annual Washington action day on Thursday that he would support the Taylor Force Act or legislation similar to it if the Trump administration is unable to get the PA to stop the payments. “[PA chairman Mahmoud] Abbas has to stop making payments to terrorists and their families, and all elected officials should call them out,” Schumer said, according to JTA. Also edging closer to endorsing the legislation was Sen. Ben Cardin (D-MD), the top Democrat on the Senate’s Foreign Relations Committee. “We’re going to find a way to pass the Taylor Force Act,” Cardin said, suggesting that he wanted changes to the bill before he could fully endorse it. The measure was named for an American who was murdered in a 2016 stabbing attack in Tel Aviv. Since the mid-1990s, the United States has contributed more than $5 billion in security assistance to the PA. However, a portion of these tax dollars are earmarked for stipends to terrorists and their families in perpetuity. According to a 2014 study by the Israeli government, based on internal PA documents, these prisoners and their families received more than $75 million in "reward" money in a single year. Support by Senate Democrats, who mostly balked at the bill when it was introduced earlier this year, would be critical to preventing a filibuster from killing it. Any version passed by the Senate would likely succeed in the U.S. House of Representatives, which also has a Republican majority. The issue of the PA paying terrorists’ salaries was brought to the forefront in recent weeks. During a recent meeting between President Donald Trump and Abbas in Washington, the president had brought up the issue of the PA’s paying salaries to terrorists and their families. Later, leading Republican senators wrote a letter to Trump, urging him to demand that Abbas end his practice of paying terrorists and their families for attacks committed against Israel. On Tuesday, Secretary of State Rex Tillerson claimed that the PA had stopped its policy of paying terrorists following pressure from the Trump administration. "They have changed that policy and their intent is to cease the payments to the families of those who have committed murder or violence against others. We have been very clear with them that this is simply not acceptable to us," he said. A senior Israeli official later said there was no evidence the PA had taken any steps to change its policy of funding terrorists and their families. “In Israel, we don’t see any change whatsoever in the Palestinians’ policies, as they continue to fund terrorists’ families. The Palestinian Authority continues to praise, incite, and support terrorist with payments,” the official stressed. (Arutz Sheva’s North American desk is keeping you updated until the start of Shabbat in New York. The time posted automatically on all Arutz Sheva articles, however, is Israeli time.